At some point, anyone who calls himself or herself a Christian is faced with a call to daily deny himself or herself, die to self, be willing to actually die, and follow Jesus. This isn’t just theoretical. It will affect the way we relate to other people. It will affect what kind of jobs we take, and when and where we take them. It should make an impact on how much we indulge ourselves. It may even at some point cost us our lives. Remember, Matthew chapter 10 begins with Jesus sending his disciples out on a training mission. He gave them certain instructions, from which we can gain certain principles, and we looked at those already. Last time, we looked at the words of warning that Jesus gave his disciples. He told them to expect persecution and trouble. But he also gave them (and, by extension, us) many wonderful words of comfort and promise, words which we can hold on to in times of trouble. The Greek word that is here translated “acknowledge,” might also be “confess.” The two root words of the Greek term, put together, really mean “to say the same thing as,” or “to speak with.” Some translations make it “confess.” I like this better than “acknowledge.” We are to confess Jesus. Confession means not only to admit something, but also to agree with something or someone. We are to say the same things that Jesus says, to agree with him. Jesus makes it clear that we are to do so not only privately, but also in public. He also says “Don’t assume that I came to bring peace on the earth. I did not come to bring peace, but a sword.” This is one of those things Jesus said that many people don’t seem to know about. You don’t have to go far to hear Christians and non-Christians alike saying, “Why do conservative Christians have to stir up so much trouble? Christians are supposed to get along with everybody. It isn’t Christian to cause controversy.” In light of these verses, I guess maybe Jesus wasn’t a Christian. He is quite clear: He is a polarizing personality; those who follow him will find themselves at times embroiled in conflict, even within their own families. This isn’t an endorsement of violence in any way, shape or form. It isn’t a license to be rude, or to bully. But Jesus does want us to recognize that following him can lead to controversy and difficult relationships. I don’t believe I’ve ever heard this preached by anyone else before. But obviously, it is right here in the text. If Jesus said anything at all, he said this as well. We can’t ignore it. These days, when we agree with (that is, confess) the things that Jesus said, or the things that his Holy Spirit inspired his apostles to write, it is easy to draw flak. If we agree with the Bible about what the Holy Spirit calls “sin,” we are called hatemongers. If we agree with what Jesus actually said about himself, we are called narrow-minded and intolerant. Following Jesus does indeed lead us to be peaceful and loving. But it does not mean that others will see us that way, or even that our lives will be free from conflict with those who do not follow Jesus or his word. Now, Jesus ratchets it up a notch. Not only does he suggest that following him can lead us into conflict, but he demands that when there is a conflict, we choose him above anything and anybody else. It’s easy to breeze through these words of Jesus. But hold on a minute: we are supposed to choose Jesus even above our own children? That is what He says here. Now obviously, much of the time we are not faced with choices like this. Following Jesus is usually compatible with loving our children. But Jesus is saying, flat out, that we should always love him more than we love our own children, or anyone else for that matter. Let’s step back a minute and look at this message. This is not merely a great moral teaching about loving other people. It is, in fact, a demand that we love Jesus, and that we do so at a higher level than we love anyone else. Unless Jesus is God, this teaching is either nonsense or pure evil. There is no sense in which Jesus is saying “Follow your own path to enlightenment.” He is not saying, “Follow me, follow Buddha, it makes no difference as long as you are sincere.” He is not saying, “Just love everybody else and you’ll be fine.” Instead, he is clearly saying: “Everything comes down to how you relate to me. I am the basis upon which you must prioritize your life and make your decisions.” To put it another way, the central teachings of Jesus are about himself. No wonder he was such a polarizing figure. 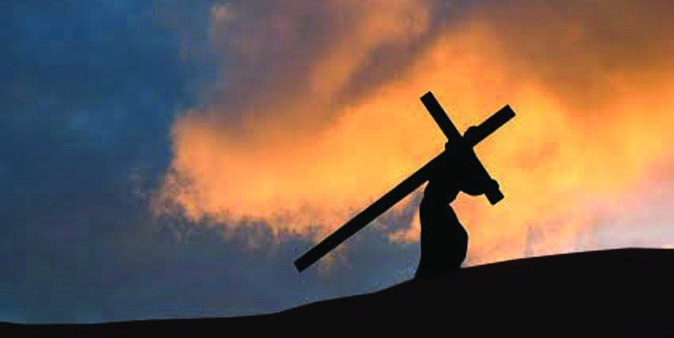 Over the years, this little part of what Jesus said has morphed into this: “I have my own cross to bear.” But this is not at all the meaning that Jesus had in mind. It’s true, each person has their own unique struggles in life; I think it’s fine to recognize that. But when Jesus was talking about taking up our cross, he wasn’t talking about that. This was the period in history when the Romans used crucifixion as a method of execution. Typically, if the condemned person was healthy enough, he had to carry the instrument of his own death to the place of execution. In other words, condemned people could be seen from time to time carrying the crosses upon which they were to be killed. To carry a cross was to be on your way to death. So when Jesus tells us that we must pick up our crosses and follow him, he is saying that we must follow in his example of dying. I think it is appropriate to understand that Jesus means, among other things, that we must die to our own ambitions, comforts, and goals. Jesus actually repeats this teaching again later on in his ministry. Luke records that the second time Jesus said it, it was “let him deny himself and take up his cross daily and follow me.” I think this definitely captures the meaning. Taking up our cross means that we deny ourselves. We don’t deny ourselves just to show that we are self-disciplined, but we put Jesus’ goals and ambitions and desires for us ahead of our own. I think it’s useful that Luke says this needs to happen “daily.” But even more than dying to our own desires, right here, Jesus is telling us that in order to follow him we need to be willing to go as far as actual physical death. Throughout the past 2000 years, many Christians have been faced with the choice to either deny Jesus or give up their physical lives. I live in a time and a place where that is unlikely to happen, even so, Jesus wants my willingness. Not even continuing to live should be more important to me than Jesus Christ. As Jesus says, if you save your own life, by compromising your relationship with him, you have actually lost it. In the next few verses Jesus’ claim is emphasized once more. He says that he is so central to everything, that when people offer respect, regard, or even a cup of water, to his followers, because they are his followers, they will be rewarded. The point here is not the reward, it is the fact of people recognizing who Jesus is and honoring that in the way they relate to his followers. It is about honoring Jesus. I hope you understand that these words of Jesus are confrontational. He is presenting us with a choice: does he have the preeminent place in our lives? Do we love him more than we love anyone else? Is Jesus our number one priority? He is claiming here that he should be. This isn’t about following a moral code, it isn’t about living according to some sort of principle. It is about making Jesus Christ, the person, number one in our lives. When controversy comes because you confess Jesus Christ, or you agree with what he says, what is your response? It isn’t wrong to seek peace with those with whom you disagree. But when peace is impossible, when agreement cannot be reached, Jesus unequivocally calls us to side with him. Now of course, we can’t be perfect in putting Jesus first. I know I fail to do that in many ways. I believe Jesus offers me grace and forgiveness when I fail. But I do think he wants me to make the choice to put him above everything, even if at times I fail in following through. It is good to know, that my failures are not the final word. Once again, we do not have the comfortable choice of viewing Jesus as a kind, harmless moral teacher. In some ways, he has been at the center of controversy for the past 2000 years. We can reject what he has said here, and call him a lunatic, or a megalomaniac. Or, we can receive him as our Lord, take up our crosses, and follow him. DO NOT FEAR! YOU ARE WORTH MORE THAN MANY SPARROWS!